Weatherly Tile & Stone offers a depth of resources that is unrivaled in New England. Recent showroom expansions have incorporated many exclusive new lines of specialty tile, including handmade glass tile and custom 36" X 40" hand cut tile, as well as rare granites and marbles. Owner Gaye Weatherly, who received a Master of Arts Degree from Oxford University, Great Britain, applies her arts education and artistic aesthetic to the creation of sophisticated tile and stone designs. Her emphasis on customer service, including availability for site visits, have earned the loyal business of leading architects, designers, and selected builders. 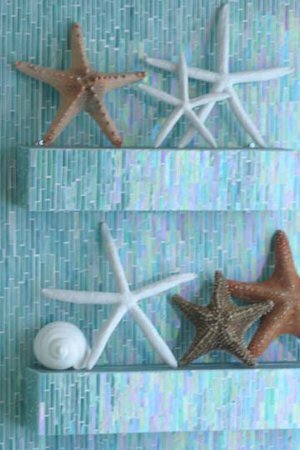 Weatherly's custom tile and stone designs can be found worldwide, and include a hotel in the Caribbean, homes in Hilton Head and Bermuda, and custom yachts in Florida and the Mediterranean. Local projects include the Newport-area mansions named Grey Craig Estate, Bridal Path, Quail Tree House, as well as private residences at Carnegie Abbey and numerous special properties in Jamestown, Block Island, and the Vineyard. Other notable projects include a residence in Trump Tower and a very special pied-a-terre in Boston.